Travelers are voting The Big Pineapple as the best roadside attraction in South Africa. Want more? Check out our map of roadside attractions in South Africa. 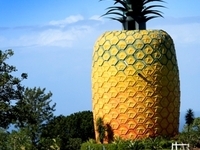 Bathurst hosts a pineapple museum whose building is shaped like a 17-meter-tall pineapple also calld "The Big Pineapple".